This question has been nagging us and our users since Android Kitkat 4.4.2. arrival on scene and our phones or tablets. And as many of you still need the answer to it, we’ll dedicate today’s blog post to it. Hope it’ll help to find peace in our souls and calm many still upset users. Before we get to the core of the topic, let me write a few words about Locus Map history. Locus Map since almost the very beginning coexisted in tranquil harmony with Android OS. It could completely migrate to SD card external memory without issues, store downloaded maps there, import points of interest, tracks and so on. This perfect partnership was breached upon the Nestlé candy update. It brought something nobody had expected – restrictions of writing to SD card for all applications. Reasons – security issues. Locus Map couldn’t write on SD card which was in case of downloading SQLitedb raster maps quite crucial, it couldn’t store even geocaches, vector maps or SRTM data, not even backup files. Out of the blue, SD card was read-only medium. …we got into a real mess. The consequences were almost catastrophic, until-then stable and fully functional Locus Map kept crashing, in some cases couldn’t even start. Locus Team went through several dreamless nights until the situation calmed down. We had to find solution quickly and soothe our enraged users – we offered a few ways how to start living with Kitkat again and wrote about it here and there. Fortunately, users could still store data manually on SD cards – therefore large map data packages could be moved via a filemanager and the path to them defined manually in Locus Map settings. It allowed us to return the SD card writing permission to Locus Map at least partially. Since then the folders with vector maps (MapsVector), SRTM data (elevation data useful for e.g. map shading – data/srtm) and backups (backup) can be transferred to SD card in Locus Map settings. Unfortunately, that’s all, more is not possible so far. All the same, we spent a whole week by looking for workarounds outwitting this peculiar idea of Google. 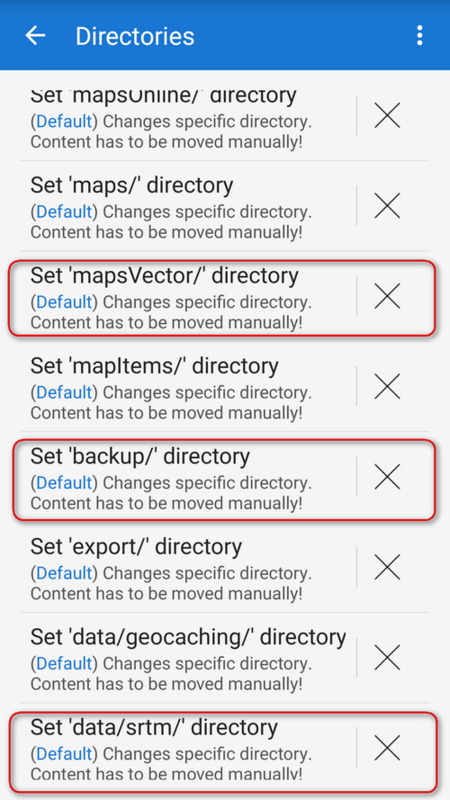 Therefore, we still recommend to keep Locus root directory in internal memory as well as the main map directory Maps where Locus stores downloaded maps from online (the downloaded maps can be moved manually to SD card afterwards and then added as “external” maps back to Locus). Check Here maps. They can download to SD flawlessly. You can use your package-specific directory, right? It is erased with uninstallation, but downloaded maps can be re-downloaded again after re-installation from the user account, right? How often users uninstall your app compared to map downloads? Optimize for the most common scenario, not the least. Hello Indrik, “maps can be re-downloaded again after re-installation from the user account”… do you have any “User account” in Locus Map to store custom-downloaded maps? Unfortunately, not yet. We’re working on it. Until it’s done, you may use Here maps instead of Locus ;). Our current solution is optimized for our current options and background. Nevertheless, you’ve written nothing new as we wrote about it 1,5 yrs ago here http://www.locusmap.eu/locus-map-does-not-run-since-update-device-to-android-4-4-2-kitkat/#solutionB. Anyway, we don’t recommend it in the latest blogpost because of the issue you mention as well – the folder is deleted during uninstall. Of course you are free to choose this method. But you guarantee payed maps can be re-downloaded, right? At least for vector maps. It is not valid for other payed maps so if I pay for it and lost my phone, I will not be able to re-download the maps I payed for in Locus associated with the same account again? I mean the Google account from which I downloaded the Locus. Vector maps are associated to that Google account, right? Or how does it work that I am able to re-download them? LoMaps, i.e. Locus vector maps can be re-downloaded, that we can guarantee as we’ve got full control over these data and we store the purchase information. But not other purchases from other providers. In case of data (phone) loss the purchase has to be made again – information about the purchases from other providers nor the purchased data themselves aren’t stored anywhere. We (Asamm Software) buy the map tiles from the provider and sell them. And we must pay for each single tile that is downloaded, therefore if you lose data, we can’t re-download them for you for free.